Wash the fish and place in a bowl. 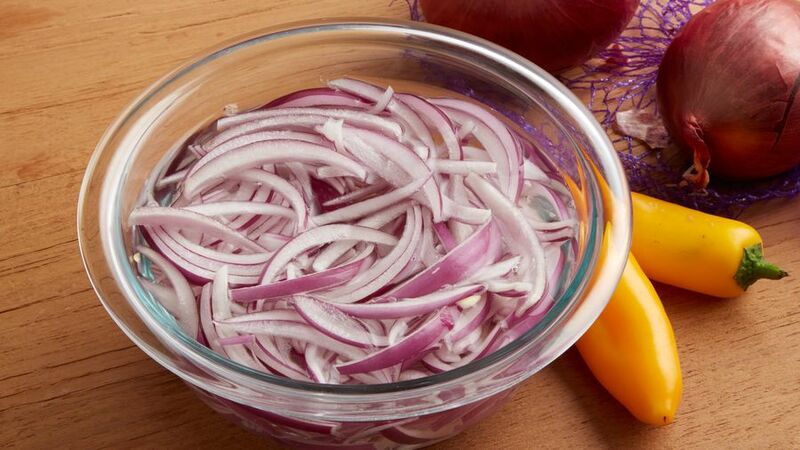 Soak the onion in cold water for five minutes and drain well. Mix the onion with the fish. In another bowl, combine the yellow chili pepper sauce, lime juice, garlic, ginger and salt. Stir well and add a few ice cubes or a tablespoonful of cold water. Pour the finished sauce over the fish. Let sit for three to five minutes. Serve on plates or in cups, and decorate each serving with a lettuce leaf and a few slices of avocado to the side. Garnish with a slice of ají amarillo and some cilantro leaves on top. 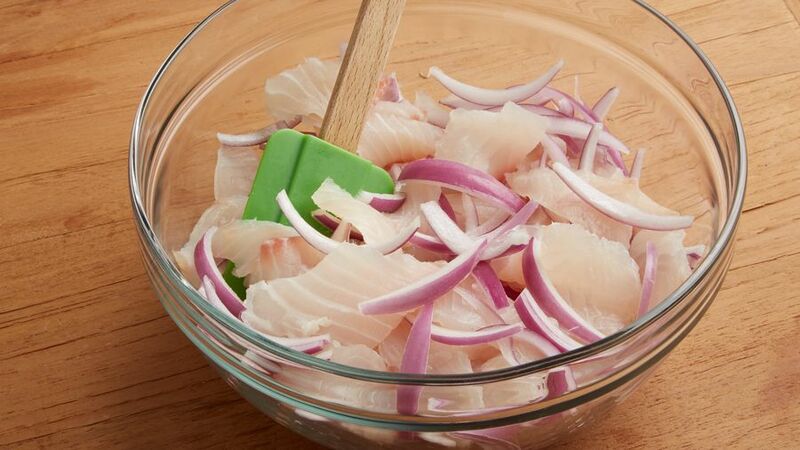 Basic ceviche only has five ingredients: fish, salt, onion, chili pepper (ají) and lime. All the versions we know today have come from this base. 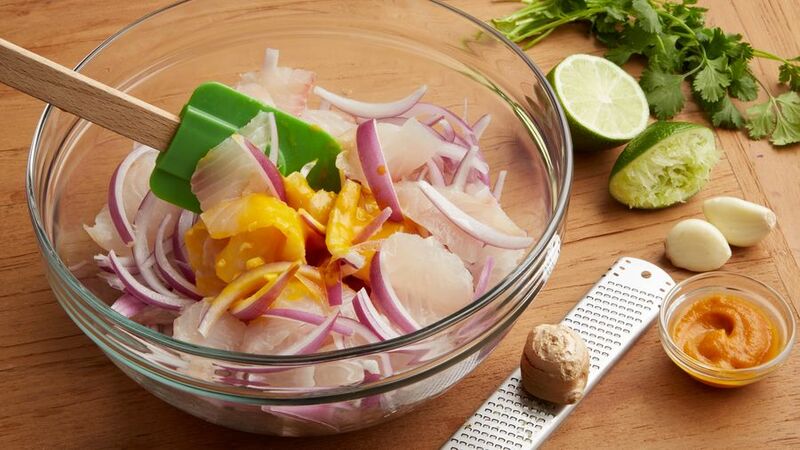 You can make ceviche with almost any kind of fish. Ceviche is usually served with sweet potatoes and choclo- the Peruvian corn with large kernels-or boiled yucca, also called cassava. In northern Peru, the side dish is always roasted corn, called cancha, and yucca. 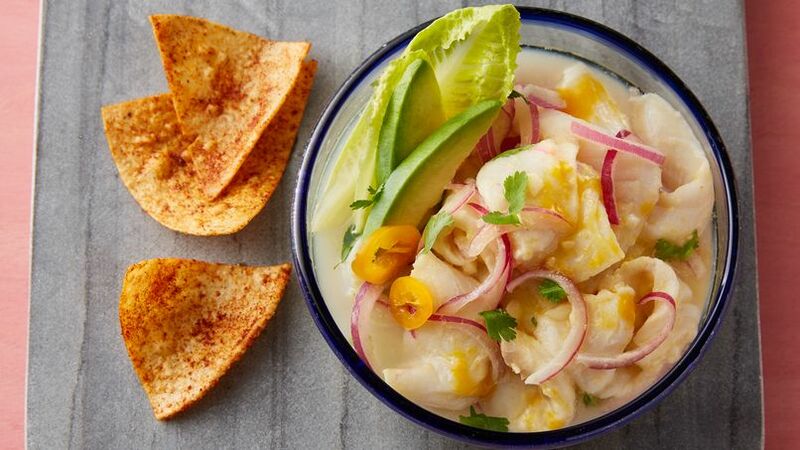 Ceviche is probably one of the most widely known foods in Latin America. This delicacy has humble and ancient origins, and has certainly evolved over time. Little is left from the old preparation of simple fish seasoned with sea salt and chili pepper (aji). The revolution arrived with lemons and onions brought from the Old World by the Spaniards. One of the most valuable qualities of Peruvian cuisine is its permeability to foreign influences. For this reason, the preparation of ceviche has changed and is no longer left to marinate for a long time, as was done decades ago. Today, thanks to the influence of Japanese chefs and their glorious raw fish recipes, the fish used in ceviche is left to marinate for just a few minutes in the potent acid of lime juice. It finishes marinating the time it takes to prepare the plate and bring it to the table. Now, there is a golden rule that experienced chefs always follow when preparing this dish: never use frozen fish. Fresh fish is indispensable for obtaining spectacular results!